A sailor set sail from Spain, Christopher Columbus was his name! The twelfth of October, mark you may; On American land, he set foot that day. 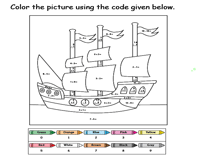 Let's commemorate the efforts of the explorer and celebrate Columbus Day with skill enhancing worksheets like coloring, addition and subtraction activity, decoding multiplication riddles, counting pictures, solving crosswords, skip counting mazes and a lot more. 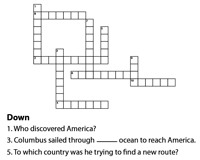 Gather knowledge of Columbus and his voyage as you puzzle out with this literacy crossword activity PDF. Read the clues and fill the grids to complete the worksheet. 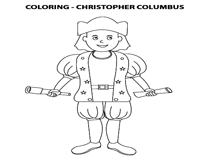 Give your creativity and imagination a free rein with this Columbus Day coloring worksheet. Coloring improves fine motor skills, develops eye-hand coordination and contributes to better handwriting as well. Count pictures related to the voyage of Columbus. 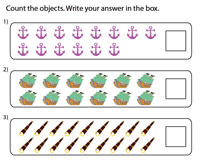 Ensure kids touch the pictures and count to improve accuracy and comprehend one-to-one correspondence between numbers and their actual count as well. Let's add a twist to your coloring. How about blending colors with math? Add and subtract the numbers to obtain the color code and then color the picture accordingly. Ahoy! Looks like Christopher Columbus has lost his way and is calling his crew for help. Skip count by 2s and help him trace his way back to America with this fun activity worksheet. 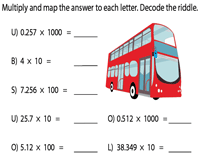 Crack the riddle by multiplying the decimals by the power of ten. Map the products to the letters and decode the riddle. Give your kids a 'Eureka moment' with this worksheet.